The United States and the European Union marriage is ending. After a long period of romance where the old continent was the lady, faithful follower of her husband, in this case, the United States, the lady has decided to rebel and divorce from what the old continent believes is a unilateral and selfish relationship. At the recent meeting held in the Balkans, the EU already decided, the United States is not a reliable nation or a good ally. Donald Tusk, president of the European Council, has fixed its position and that’s perhaps what the European Union will have in the coming months. The United States, and specifically the American president, only care about his “American First” and has forgotten its fundamental allies to maintain world order. As in many relationships, conflict begins when one does not support the other. Well, the United States has not wanted to support the European Union so far in Trump's term. Donald has widely demonstrated that his position regarding Europe was not a simple populist discourse, his key decisions on the Paris agreement, his criterion on the obsolescence of NATO, the protectionist and tariff measures and, now the rupture of the agreement with Iran, has made it very clear. The time of the hypocritical protocol between the two is over. The US president decided to support the Brexit without considering the economic impact it would have on the old continent. Trade between Great Britain and the United States originates nearly 250 billion dollars. According to estimates, of that amount, a total of 123,500 million dollars correspond to US exports, while North Americans import 20% of the global sales of the United Kingdom. London to finally break with the European bloc would renegotiate the sums of investments for the coming fiscal year. Donald Trump vehemently believes that the European Union was created to take advantage of the United States economically. During the rally held just weeks ago in Michigan under the motto Make America Great Again, Trump said: "The European Union was formed to take advantage of the United States. Do not blame Xi, or Prime Minister Abe, do not blame them for taking advantage of us." This sustained criterion of Donald Trump has been in all areas. A few months after his arrival to the presidential chair, he demanded in the Pentagon the Europeans to pay more to the military organization. On his point of view, the European nations were paying very little and the United States kept its expenses on defense. Trump has followed his motto American First. He cared for anything else. His departure from the Joint Action Plan with Iran has been a huge blow to the economy of the European Union. Great and juicy financial and economic pacts between the Old Continent and the Persian nation have been overturned. Companies such as Airbus and Peugeot, as well as oil agreements, are on the edge of the precipice of worsening the American position on the matter. 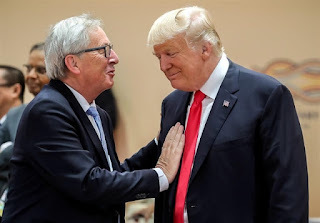 The United States has been selfish in all its decisions, but above all, it has not considered the criteria of the European Union, another of the satellites of its own. The economic bloc has supported most of the measures of its American allies, including some extraterritorial ones like the sanctions against Venezuela, North Korea and Cuba. Since the departure of Donald Trump from the Paris agreement, the discontent of the old continent has increased. Although the United States considered at the time that the environmental pact was weighing on the American economy, specifically its industries, the Europeans consider this agreement fundamental to reverse the environmental situation of humanity. Everything is more than clear. The United States has decided to break a relationship of almost 70 years with the European Union. As Einstein said, everything has its end and even the stars die. Europe is claiming the role that historically has belonged to it, or at least, wants to be respected by the nation that emerged centuries after the political, industrial and economic splendor that they had. The French President Emmanuel Macron has exhorted his European counterparts to safeguard their territories without relying on the United States. "Some powers have decided to break their promises: we are facing great threats and Europe has a duty to maintain peace and stability in the region," he commented on the current US position. Meanwhile, Donald Tusk has condemned the latest decisions of the US president as acts of treason. "If you look at President Trump's latest decisions, someone might even think with friends like that, who needs enemies? ", he said during the Balkan summit. The kisses and hugs of the United States are already similar to those of Judas Iscariot for Europeans. German Chancellor Angela Merkel has already expressed it publicly: "Europe can no longer trust the United States. Instead, the EU must do with its own destiny, that is the task for the future," she said recently after Trump's decision to abandon the Iranian pact. The position of the German leader Angela Merkel is to prop up the foreign policy in a hurry since she realized that her historical ally has ceased to be so. For Merkel, Germany must do more, and as part of this measure has frozen its budget in defense for the next five years, in response to the excesses of the United States that demands a greater contribution from the European member states of NATO. From now on, the roads seem to separate unless the Europe begs for the alliance with the United States. Since the Bretton Woods agreement, Europe has been tied to the nation of Lincoln in a relationship of love and hate that only an orate like Trump has had the courage to undo it.